In 2009 we completely rebuilt the original 1892 building of the famous Přibylova weaving mill and turned it into a modern production plant. In 2015 we also opened our own thermal and light laboratory. 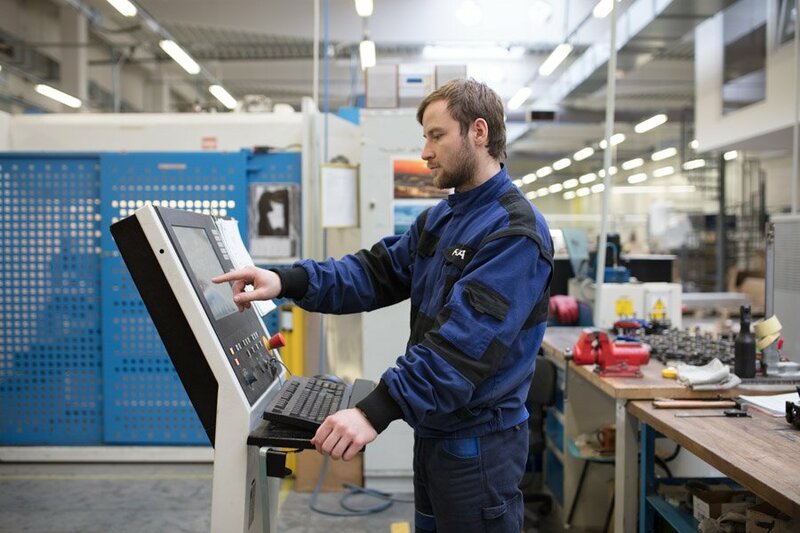 A total of 120 employees work in Nové Město in the development, purchasing, planning, and technology departments and in the warehouse and production. What goes on inside the plant? Production itself is divided in to a mechanical and assembly workshop. 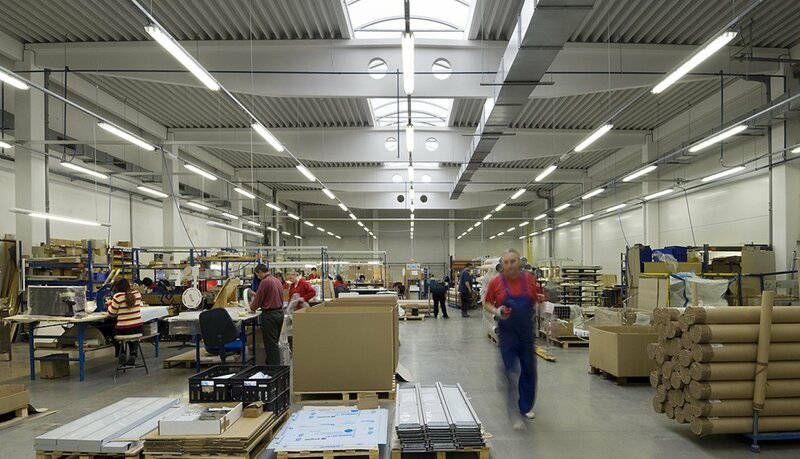 In the mechanical workshop semi-finished products specific to Halla luminaires are made. Special machines are used to cut profiles and roll frames, sheet metal is punched on Trumatic machines, and material is folded, welded and milled on CNC machines. In the assembly workshop the luminaires are then assembled. 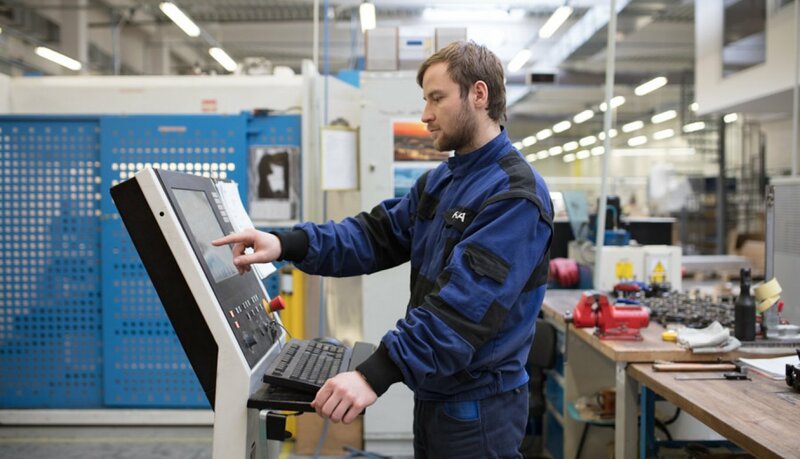 There is also assembly, the connection of components, testing, measuring and packaging. The warehouse, converted from the main building of the old textile plant, constitutes a separate part. The warehouse has an area of 3500 m2 and 3400 pallet spaces on shelves 6m high. We warehouse 4200 types of goods here. We use online mobile terminals to manage the warehouse, and every day we dispatch around 30 to 50 orders. 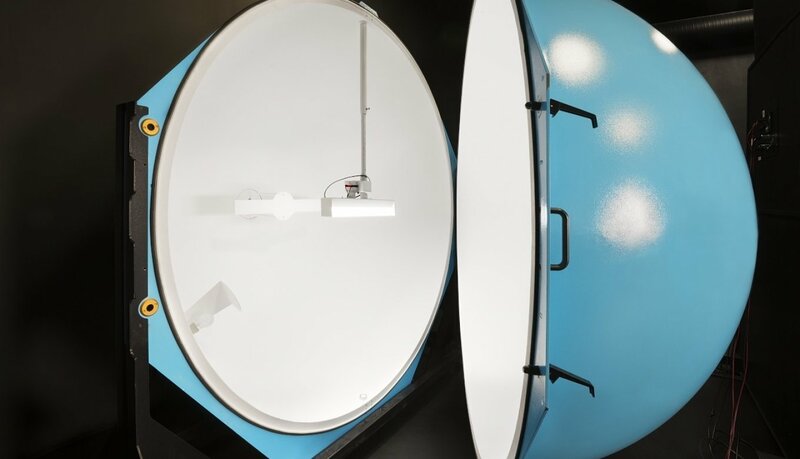 For the development of luminaires thermal and optical measurement is essential and is performed in the development laboratory. The principal areas of the laboratory are the black room with goniophotometer and integrating sphere and thermal draught-proof chamber. 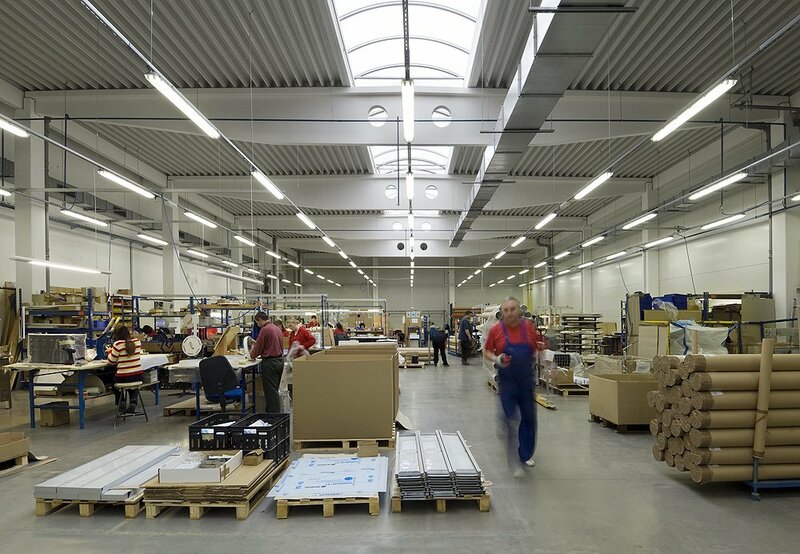 The dropped ceiling for installation and testing of luminaires is also a part of it. The most important part of the laboratory is the black room with goniophotometer and integrating sphere. The actual black laboratory consists of 5 rooms. One of them is used for air-conditioning equipment, because the ambient temperature during measurement must not fluctuate by more than 1 °C and is maintained at a value of 25°C. Light emitted during measuring passes through the other four rooms to the detector in the last of them. As a result of the black colour of the laboratory there are no parasitic reflections, and thus the light emitted during the measurement reaches the detector in the most accurate possible quality. The goniophotometer serves to measure the radiation characteristic of the luminaire, i.e., the diffusion of luminous flux in space. The measured curves are passed on to customers, architects and lighting designers in the form of data for the computer program DIALux. They use the data for accurate calculation of artificial illumination when designing the lighting system. During measuring the luminaire is put in the working position and it rotates around the axis of a mirror. The beam from the luminaire is reflected by the mirror to the detector, which senses the amount of light radiated at a given angle. By a gradual measurement of the amount of light radiated by the luminaire in the individual directions we arrive at its diffusion throughout the entire space. the luminaire is measured after the temperature has stabilised. It heats up for 30 minutes before measurement. An integrating sphere is a photometric laboratory measuring device in the form of a hollow sphere. It is painted white inside, diffusive with high reflectivity and colour non-selective. The measured sample is placed at its centre. The integrating sphere has an opening for a photocell, which is located beyond the inner diaphragm in order to prevent direct illumination from the measured source (luminaire). The output data are processed in the control software with saving in a clear protocol. 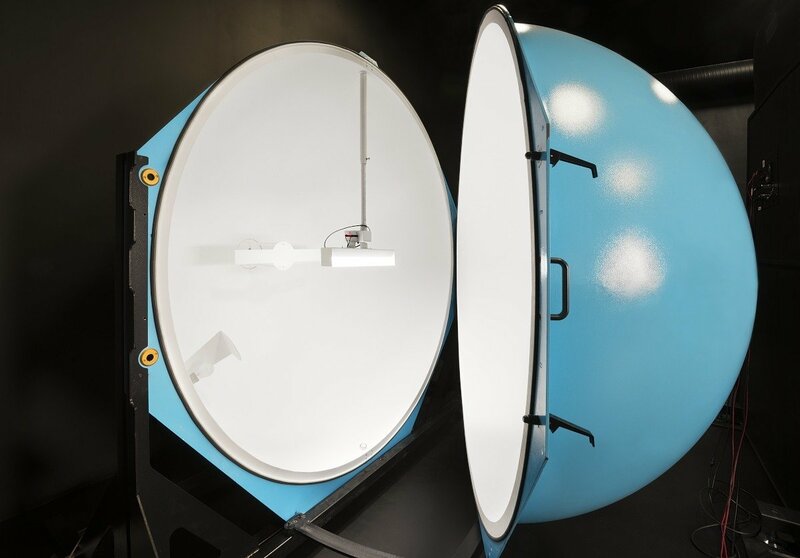 A larger integrating sphere with diameter of 2m serves to measure entire luminaires and individual light sources. The smaller one with a diameter of 30 cm is used for measuring LED chips and small light sources. The sample is measured after the temperature has stabilised, the actual test lasts 10 seconds. The thermal chamber, properly called a thermal draught-free chamber, allows the measuring of thermal management up to a dimension of one metre. The luminaires are measured here when the temperature is stable, with a maximum deviation of one degrees Celsius. According to the standard the value in the room is designated as 25°C, but we intentionally make these conditions worse, and we measure at a temperature of 30°C in the thermal draught-free chamber. On the basis of the assessment generated it is possible to state whether the luminaire is fit for use or not. The usual period of our measurement is 12 to 24 hours. According to a standard a basic condition is established which mentions a minimum of 1 hour when the measured temperature is stable and does not change. The Halla laboratory has a very low value for the deviation of measurement, which is around 4%.